Does activestate planning to release perl 5.18? I would like to use ActivePerl occasionally from USB Stick but don't want to install it permanently on a computer. Is there no "portable" version available for download? 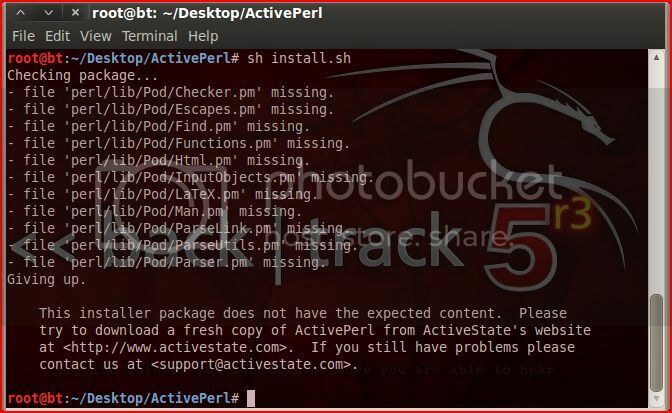 when i tried to install activeperl on my Debian 7 box I received the following error: "perl/bin/perl: 1: perl/bin/perl: Syntax error: Unterminated quoted string"
Please advise how to fix. Nevermind... Must have been a temporary thing. The following links from http://www.activestate.com/activeperl/downloads point to non-existant files. I installed ActivePerl under "C:\Program Files\" and when I run PPM it just doesn't update the repository, says there's a permission problem? I installed it as the System user and have done everything to give Perl64 under "Program Files" read+write permissions, no use. On the other hand, installing Perl64 directly under "C:\" doesn't have any of the above mentioned problems, just that it's better to maintain a proper hierarchy, hence installation under "C:\Program Files\". Incompatible version trying to install 5.16.2 over 5.16.1? "The selected directory contains an incompatible version of ActivePerl. Please choose a different installation location!" I find this difficult to believe because I am trying to install 5.16.2 Build 1602 over 5.16.1. Build 1601 ... seriously, one minor revision cannot be upgraded? Installation Prob: Missing Files? False Directories? Hey everyone, ill try to keep things simple. just like the READ-ME says. I have used Active State Perl for a few years on other machines (XP, Vista), but am unable to get Perl to install correctly on my new Windows 7 64 bit machine. When I run a Perl script that outputs to the screen, I see no output. The output screen is blank (no errors appear). Embarrassingly even a simple "Hello" program won't run.